Coffee has come a long way in the past few years, with brewing methods constantly evolving and shifting as baristas and connoisseurs search for the perfect cup. 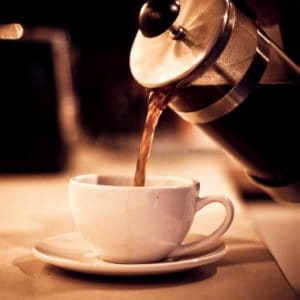 With so many brewing devices, like professional coffee makers, techniques, and methods now available to home baristas, it can be difficult to choose a method to prepare your morning coffee: is the convenience of auto drip coffee worth missing some flavors? 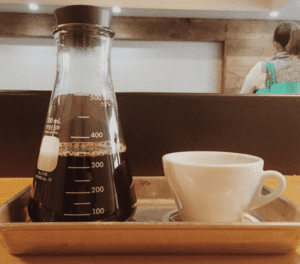 Are all pour over methods created equal? Even if you can’t tell the difference between and Aeropress and a French Press, we can help you decide on a brewing method. We’ve examined some of the most popular tools and techniques—along with a few less-common brewing methods—to show you the wide range of options you have when it comes to your morning cup. For ease of navigation, we’ve broken these techniques into three main categories: steeping, pour over/drip, and vacuum. 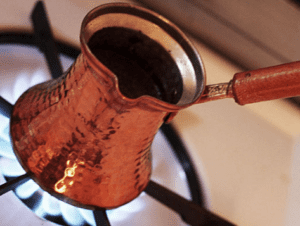 There are several brew methods that involve fully immersing ground coffee in water, ranging from “cowboy coffee” (adding coffee grinds to boiling water and serving the resulting liquid) to methods like Turkish preparation, which uses a pot called an ibrik and finely-ground coffee. In the mood for something BOLD? Check out these top Turkish coffee grinders. The French Press is one of the easiest and most commonly used methods to brew a bold cup of coffee. Add grinds to the press, followed by not-quite-boiling water, and allow the mix to steep for four minutes. Then, simply press the plunger and filter downward, pushing the grinds to the bottom so you can pour your coffee. Simple but effective. You’ll want a very coarse grind for French Press, since coarser coffee is more permeable than finer grounds. You can read more on my top french press coffee brands here. This will both help when it’s time to plunge the filter and prevent coffee from slipping between the filter and the inside of the container while you’re brewing. You’ll still probably see fine particles at the bottom of your cup if you pour directly from the press, however, so it’s often a good idea to decant the coffee. 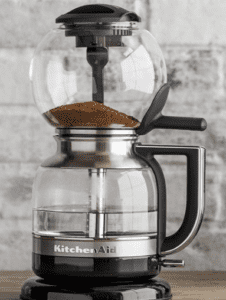 Finding the Right French Press Coffee Grinder: Check out this guide. 2Caff’s Top French Press Makers: Check them out here. 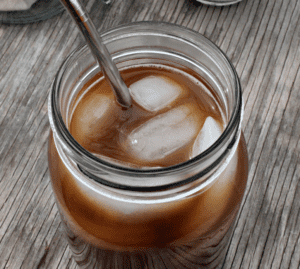 Fair warning: once you start making cold brew using a Toddy or a DIY system, any lesser version of iced coffee will be ruined for you. Cold brewing involves mixing coarse ground coffee with cold water and letting the mixture steep overnight—sometimes for up to 24 hours. The resulting concentrate can then be mixed with cold water and ice for a perfect glass of ice coffee, and because the grounds are steeped in cold water, there’s a lot less bitterness to the resulting coffee. The Toddy system is probably the most popular method for making cold brew concentrate, but there are also many ways to make cold brew concentrate using materials you may already have in your kitchen, as long as you’re able to filter the coarse grinds from the concentrate once it’s done steeping. Be sure to make a big batch, since the concentrate will keep for several days. 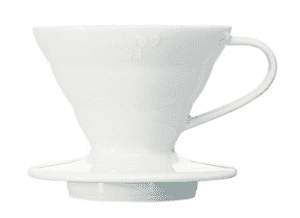 While the term “pour over” encompasses a wide variety of brewing methods, equipment and techniques, the core of the technique is the same for all of these methods. Hot water is poured over the grinds, passing through to a vessel that collects the coffee. There are countless iterations of pour over coffee on the market, and the technique is known for producing balanced and delicious results. If you are trying to figure out where to get started with the best “pour over” systems, check out this resource we created. 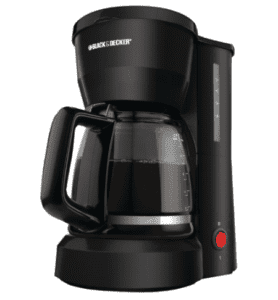 Drip coffee is the default in most kitchens, mainly because it is simple and reliable. An automatic coffee machine will produce almost the same cup of coffee every time, and there’s no need to wait by the the machine while it’s brewing, so you’re free to make breakfast or hop in the shower while your coffee brews. Add water to the reservoir, add ground coffee, and turn on the machine. The price for this convenience is that each cup will not have the full range of flavor and body you’ll get from a more time and labor-intensive method. Your coffee will be good, but not great. You can improve the flavor of auto-drip coffee by grinding your beans immediately before each use and dampening the paper filter before adding coffee to remove the papery taste, but this does cut down the convenience. You can read more about the 2Caff communities top recommended auto drip brewers here. Ceramic drippers like the Hario V60 (and similar models made of plastic or metal) have exploded in popularity in the past few years because they provide users with a great balance of convenience and control over each cup. Pour over drippers require very little setup and cleanup: simply place a disposable filter in the dripper, add coffee, and pour hot (but not boiling water) over the grinds. The coffee will filter right down into your cup. The main drawback of a dripper is that it only makes one cup of coffee at a time. If you’re brewing for a household, you may find the process too slow, even if the resulting cup of coffee is particularly clean and delicious. There’s also a lot of technique involved with pouring the coffee, giving the grinds enough time to bloom, and making sure you don’t overfill the dripper. 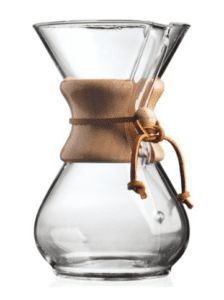 The Chemex balances the taste of pour over coffee with the ability to brew a large batch. Much like the Hario V60, all you need to get brewing is a filter, your coffee, and a pot of hot water. Boil a kettle of water and use a small amount to soak the filter and warm the vessel, then dump the water and add medium-coarse ground coffee. Pour a small amount of hot water and give the coffee about 30 seconds to bloom, then slowly add the rest of the water by pouring in a circle around the edges of the filter. The Chemex is a beautifully designed brewer, with an hourglass shape and wooden handle that looks both contemporary and timeless. The bonded filters are a lot thicker than others, and produce a less bitter and acidic brew. The only problem is that you need to buy Chemex-brand filters, which are more expensive than other filters. These two methods are very different, and only one is a true “vacuum” style brewer, but we are categorizing them together because neither fits particularly well in the other categories. In both form and function, these are definitely outliers when it comes to brewing coffee, but each has its share of devotees who will tell you it makes the best cup of coffee you’ve ever had. A relatively recent addition to many kitchens, the Aeropress is built for convenience and portability. Load the bottom cylinder with a paper or metal filter and some ground coffee, and slowly add the desired amount of hot water. Mix the grounds and the water and insert the top cylinder with the rubber stopper down. Then, slowly press the top cylinder down to create a vacuum that forces the hot coffee through the filter, right into your cup. 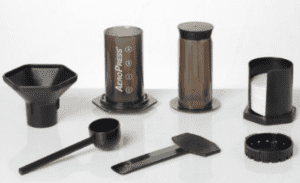 Aeropress brewers are well-designed and very durable, and filters are cheap and widely available. Their one drawback, however, is speed: they only make one cup at a time, and it’s a small cup at that. For a delicious single cup, however, the Aeropress is a great manual device that combines the functionality of a French press with the control of a pour over dripper. Since it’s made of plastic it’s also extremely portable—toss it in your weekend bag so you don’t have to drink hotel coffee. 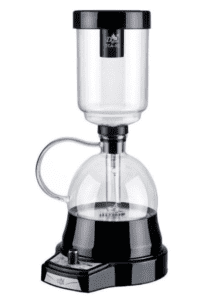 The coffee geek’s gold standard, the siphon brewer is not what anyone would call an entry-level method. Coffee siphons feature two chambers, with water added to the bottom and heated to a boil using an external burner. Once most of the water has been siphoned to the top chamber, ground coffee is mixed in, the heating element is removed, and the coffee filters back down into the bottom chamber. Siphon brewing is a highly technical method, since it uses a vacuum, vapor and air pressure to brew a pot of coffee. It requires a lot of equipment and a great deal of technique, but the tradeoff is that the resulting coffee will be clean and clear and very tasty. It may not be the most practical method for everyday use, but if you have space to store the brewer it can be an impressive technique to bring out for guests and special occasions. There’s no “right” way to brew coffee (although there are many, many wrong ways), and finding your favorite method will take some experimentation and a decision about balancing convenience and taste. You may find that the extra work makes that first cup even more rewarding, or you may discover that you prefer the convenience of an auto-drip machine for daily use. You can always use different methods on different days: if you find yourself with a wide-open weekend morning, break out the Chemex and reward yourself with a slow, hand-poured cup of coffee instead of using the machine. You’ll probably notice that different methods produce different tasting notes from the same coffee, which can also help you decide how you’d like to brew. Previous Post: « Keurig K475 vs K575 – Whats the Difference and Which is Better?